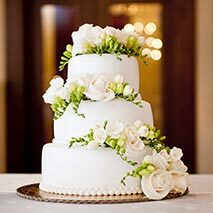 We create the most delicious & elegant wedding & birthday cakes in Newcastle. We take great pride in every creation, as they are all special in their own individual ways. 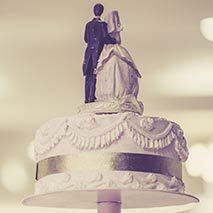 We create the most amazing bespoke cake designs including tiered wedding cakes, chocolate wedding cakes, classic wedding cakes, engagement cakes, birthday cakes, christening cakes, & cupcakes for all occasions. The shoe cake was a resounding success! My mum loved it and was really quite overwhelmed, and everyone else was really impressed! It was definitely a talking point at the party! You are very talented and if I need a cake for a special occasion again, I know where to come. Thank you so much again for making it for me. I ordered a surprise 50th birthday cake from Julie in December 2014. She also arranged delivery of the cake to the venue so that I didn’t have to worry about hiding the cake. 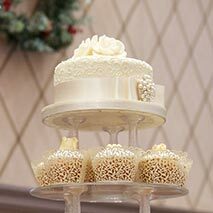 Julie’s website is easy to use and displays a vast selection of cake designs. I went for the chainsaw cake as my partner is a tree surgeon. The attention to detail was commented on by my partner and his work colleagues. Furthermore, the cake tasted good and hardly lasted us a day. I would strongly recommend using Julie; she is reliable, trustworthy and takes pride in her work. Thank you for all your efforts and for making my partner’s 50th special. Everyone loved the cupcakes and especially the hidden surprise in the middle. Some even sneaked one more away with them; they were that good! 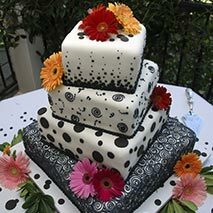 The wedding cake was amazing, all the guests could not have enough of it. We always get any birthday or wedding cake from Julie and she always exceeds expectations. Will always recommend her to everyone. Thank you very much the cake, it was very nicely decorated and tasted very nice. Everyone loved it. I would recommend you to all. Great communication and high standard of service. Thank you once again. © All Rights Reserved Celebration Cakes by Julie.